The strategy was simple: when corrupt politicians show their faces, we drop their masks. In a year when politicians must ask for votes to a country where there is a smartphone for each citizen, we gave a useful weapon to voters that left the corrupt ones no place to hide: a simple and free app. Since voting is mandatory in Brazil, Corruption Detector app has put, for the first time, the hunt for dirty politicians in the hands of people. People can now see the true face of corrupt politicians, and with an up and coming election, 120 million voters can now change the face of the country. In just one week, Corruption Detector became the most downloaded App in Brazil, with more than 400.000 downloads. It was also highlighted as #1 Apps We Love at Apple Store and #1 Trending Apps at Google Play. In a few days, Corruption Detector took over the media and social conversations. With zero media investments, more than 120 million people were impacted. The project became a mass topic of discussions of voters and authorities, including Federal investigators at the Operation Car Wash and the Attorney General of the Republic, Rodrigo Janot. As a result, while corrupt politicians tried to sue us, clean politicians used it on social networks to promote their integrity. But, most importantly, by knowing the true face of each candidate, voters can now change the face of the country. The Corruption Detector app uses Microsoft facial recognition technology, which gives it 98% accuracy. In order to create our database and make it simple for anyone to understand, we had to gather data across hundreds of courts all over Brazil. It took us months to analyze, select which accusations and investigations concerned corruption or public administration fraud, and organize the information into one simple list. Then, we translated the legal jargon into all those incomprehensible court records into language anyone would find easy to understand. The app was launched by one of Brazil’s most renowned comedians, who went to Brasília, and stood outside Congress, taking selfies with politicians and showing Brazilians how the app works. Since then, the number of downloads has never stopped growing. 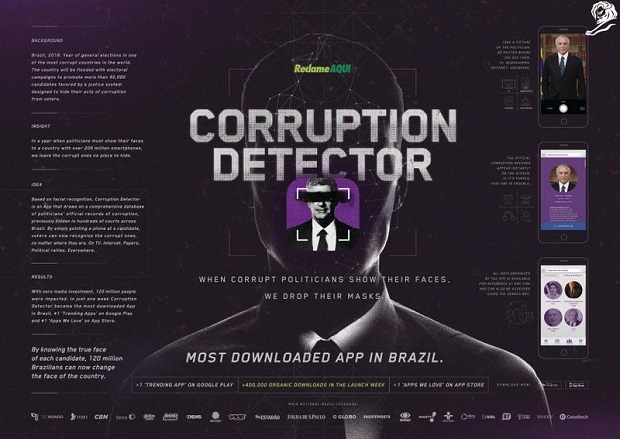 Based on facial recognition, Corruption Detector is a free APP that draws on a comprehensive database with all the official records of corruption, previously hidden in hundreds of courts across Brazil. By simply pointing a phone at a candidate, voters can now spot the corrupt ones in purple, no matter where they are: TV, papers, internet, outdoors and even in person. All data organized by the app is available for reference at any time. And on election day, users will receive an important notification: a reminder not to vote for a corrupt politician.